First deployed in September 1959, the Atlas (SM-65), was the nation's first operational intercontinental ballistic missile (ICBM). The missiles, however, saw only brief service and the last squadron was taken off operational alert in 1965. Despite its relatively short life span, Atlas served as the proving ground for many new missile technologies. Perhaps more importantly, its development spawned the organization, policies, and procedures that paved the way for all of the later ICBM programs. The Atlas incorporated two novel features. The first was its "stage-and-a-half" propulsion system consisting of two large booster engines flanking a smaller sustainer engine. Unlike the later ICBMs in which the first, second, and third stages fired in sequence, all of the Atlas engines were ignited at liftoff. Another interesting feature was the pressurized integral fuel tanks. The Convair designers adopted this technique to save weight. The huge tanks, which constituted 80percent of the missile's mass, were built from thin sheets of stainless steel, ranging between 0.1 and 0.4 inches thick. When empty, the tanks were filled with nitrogen gas at 5 psi to maintain a positive internal pressure. During the launch sequence, the two boosters and the sustainer engine were ignited on the ground and the two small vernier engines mounted above the sustainer came to life 2.5 seconds after lift-off. After leaving the launch pad, the missile accelerated rapidly, gradually nosing over in a gentle arc toward the target. Once in flight, the booster engines burned for 140 seconds. After receiving a staging signal from the ground station, the booster engines and turbo-pumps were jettisoned into space. The sustainer engine continued to bum for another 130 seconds, and then it too fell silent. Final course and velocity corrections were made by the vernier engines. At the apogee of its elliptical flight path the missile reached an altitude of 763 miles and a speed of approximately 16,000 miles per hour. Elapsed time for a flight of 6,785 miles: 43 minutes. In June 1947, further budget reductions led the AAF to cancel the remainder of the MX-774 program. Since Convair's work was well under way, the Air Force (it became a separate service in September 1947) allowed the company to use its remaining funding to build three small missiles to test the feasibility of the swiveling motors, guidance sys-tem, and the separable warhead. The tests, conducted in late 1948 and early 1949 at the White Sands Proving Grounds in New Mexico, were encouraging. The missiles, called the Hiroc: (for high altitude rocket) or RTV-A-2s, confirmed the practicality of Convair's innovations. The results, however, were not enough to dissuade the Air Force from canceling the project, and without a government sponsor, the future of the ICBM appeared dim. At the last moment Convair decided to support the program itself, and over the next 2 years invested $3 million in it. The Air Force renewed its support for the ICBM program in January 1951, an action prompted by the enthusiastic endorsement of the Rand Corporation and a substantial increase in research and development (R&D) funding brought on by the Korean War. The Air Force designated the new effort the MX-1593 project and directed Convair to evaluate air-breathing and ballistic missiles capable of carrying an 8,000-pound war-head 5,750 miles and striking within a circular error probable (CEP) of 1,500 feet. (A measurement of accuracy, the CEP is the radius of a circle within which half of the ordnance targeted for the center of the circle can be expected to land.) Convair completed the missile study in July 1951, and once again the airframe manufacturer reaffirmed its support for ICBM. The design it submitted for the ICBM, which it now called Atlas, called for a mammoth weapon 160 feet tall, 12 feet in diameter, and powered by 5 or 7 large engines. In September 1951 the Air Research and Development Command (ARDC) urged that Headquarters, USAF (often referred to as the Air Staff) immediately begin full-scale development of the ICBM. ARDC estimated that with the "proper application of funds and priorities" Atlas could be operational by 1960. The Air Staff demurred. It did not share ARDCs enthusiasm; instead it advocated a more cautious approach. It wanted to develop the major subsystems such as the engines, fuselage, guidance system, and reentry vehicle first, and then build the test vehicle. New technology soon changed the nature of the debate. In 1952 ARDC learned that forthcoming improvements in nuclear weaponry would soon reduce the weight of the missile's warhead from 7,000 to 3,000 pounds without reducing the yield. At the same time the United States was also making major strides in developing powerful new rocket engines and precision guidance systems. In the fall of 1952 those new technologies, coupled with the Army and Navy's attempts to wrest control of the ICBM program away from the Air Force, forced the Air Staff to act. At its request ARDC formulated a list of military characteristics for a "Strategic Ballistic Rocket System" capable of carrying a 3,000-potind atomic warhead6,325 miles to within 1,500 feet of its target. ARDC estimated that if Atlas was accorded a 1-A development priority it would be operational by 1962. The Air Staff refused to accord the missile program with the priority ARDC sought, and as a compromise, in February 1953 ARDC proposed a three-tier test plan using test vehicles powered by one, three, and five engines with the last missile serving as an operational prototype. ARDC estimated that the revised R&D program would take approximately 10 years and cost $378 million. The Air Staff approved the revised plan in October and issued ARDC a development directive to begin work. The directive, however, lacked the vigor that ARDC sought. It estimated that the R&D phase would not be completed until sometime after 1964 and also assigned Atlas a 1-B development priority. ARDC designated the Atlas program Weapon System (WS)-107A. Although scaled down from earlier designs, the missile remained an ambitious undertaking. It was 110feet high, 12 feet in diameter, and when fully loaded, weighed 440,000 pounds. Propulsion was to come from five engines: four first-stage engines clustered around a single sustainer engine. At the Air Staff's insistence the Atlas program would have continued down its slow and conservative path had it not been for the February 1954 Teapot Committee report. Chaired by the renowned mathematician John von Neumann, the committee recommended a "radical reorganization" of the entire Atlas program. The committee estimated that if the government followed all of its recommendations, Atlas could be operational in 6 to 8 years. The Air Force accepted the Teapot Committee recommendations, and on May 14,1954, it accelerated the Atlas program to the "maximum extent that technology would permit." It accorded Atlas a 1-A top priority status, and of equal importance, directed that it be given priority over all other Air Force programs. During the spring and fall of 1954 the Air Force and the two most important con-tractors, Ramo-Wooldridge Corporation (systems engineering and technical direction)and Convair (structures and assembly), worked feverishly to revise the Atlas design based on a 1,500-pound, 1-megaton warhead. The thorough redesign cut the size of the missile almost in half. the weight decreased from 440,000 to 240,000 pounds and the number of engines was reduced from five to three. The Western Development Division awarded a development contract for the Atlas to Convair in January 1955, and Convair completed construction of the test stands in 1956. 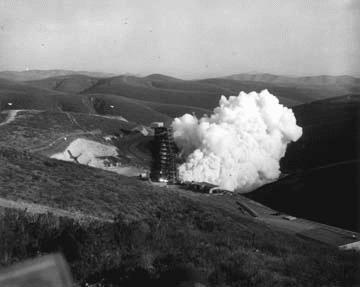 Convair Division of General Dynamics Corporation conducted static test firings of an Atlas missile at its Sycamore Canyon test facility northeast of San Diego. The hallmark of the Atlas deployment schedule was urgency; escalating tensions with the Soviet Union sent the Air Force scrambling to deploy the missiles as rapidly as possible. Initially the Air Force planned to deploy 4 squadrons of 10 missiles each, but in December 1957 the Department of Defense expanded the missile force to 9 and later 13 squadrons. Originally the location of the launch sites was determined exclusively by the missile's range; they had to be within 5,000 miles of their targets in the Soviet Union. Later, other factors that influenced the placement of the sites was that they be inland, out of range of Soviet submarine-launched intermediate range missiles; close to support facilities; and as a cost cutting measure, be built on government property whenever possible. A plant in Pennsylvania produced the material for the skin, long stainless steel bands a yard wide and less than 40-thousandths of an inch thick, and sent it in rolls to the Atlas plant in San Diego, CA. Each band was joined at the ends to form a ring 10 feet in diameter and then mated with the others, edge over edge, the seams being carefully welded inside and out. As each missile tank was assembled, it was supported by special rings that held it sturdy because it had no integral supports of its own. When completed, the tank was filled with pressurized nitrogen gas, which stiffened the structure and smoothed the skin. It was then removed from the support rings and transferred to assembly docks where it was fitted with electronic equipment, plumbing lines, and a sustainer engine. The booster engine compartment was later rolled into place around the sustainer engine, while an adapter section and a nose cone (produced by General Electric) were attached to the forward end of the tank. As much as possible, the Air Force tried to adapt existing plants, especially idle aircraft plants, to missile production. Air Force Plant 19 in San Diego (the old Convair bomber plant) manufactured the first Atlas missiles. Full production of the Atlas missile took place at a $40,000,000 plant built outside of San Diego. This plant consisted of 6 large buildings and 14 smaller ones on 252 acres. The manufacturing building was an unimpressive box-like building. There was no long production line as such. During assembly the missiles sat side by side on raised docks designed so workers could crawl around, under, and over the birds as the need arose. As a missile was completed it was lifted gently by overhead cranes and placed on a sixty-four-foot trailer which stayed with the missile until it was erected in firing position. The Air Force built six variations of the Atlas missile. The Atlas A, B, and C models were used exclusively for flight testing. The later Atlas D (PGM-16D/CGM-16D), the Atlas E (CGM-16E), and Atlas F (HGM-16F) models all saw service in the field. During powered flight, the Atlas A, B, C, and D models were guided by a General Electric/Burroughs radio-inertial guidance system that received course corrections from ground-based computers. The Atlas E and F models used the American Bosch Arma all-inertial guidance system. The all-inertial system was capable of detecting deviations from the preprogrammed flight path and formulating midcourse corrections independently. The Atlas A was the first R&D configuration that ultimately led to the operational Atlas D, E, and F missiles. It consisted of minimum propellant, propulsion, and guidance systems. Its maximum range was only 600 nautical miles, and its maximum altitude was 57.5 nautical miles. Flight testing for the Atlas A began in June 1957. The initial test vehicle, the Atlas A, contained only the two booster engines and a dummy nosecone. A total of eight Atlas As were launched--all on the Atlantic Missile Range--during the period June 1957 to June 1958. Six of eight test flights blew up on the launch pad or were destroyed shortly after takeoff. Two missiles had successful flights of 600 miles. The Atlas B series was a more sophisticated missile complete with a sustainer engine and separable nosecone. The B series was the second Atlas developmental configuration. Its propulsion system was close to operational capability. In July 1958 the first one exploded soon after launching, but the following November an Atlas B roared 6,000 miles down range, and one series B missile traveled 5,500 nautical miles down the Atlantic Missile Range. Atlas 4-B, the second in the series B test flights, was launched successfully on 2 August 1958. The eighth missile in the series, Atlas 10-B, placed itself into orbit with the Project SCORE payload on 18 December 1958, becoming the world's first communications satellite in the first successful use of the Atlas as a space launch vehicle. The Atlas C was a semi-operational version that contained several advanced features. It was first launched successfully in December 1958. The Atlas D was equipped with radio-inertial guidance. First tested in April 1959,three Atlas Ds were place on operational alert at Vandenberg AFB in late 1959. The Convair Division of General Dynamics produced three different models of the Atlas ICBM destined for deployment with the Strategic Air Command. The first operational version of the Atlas, the "D" model, was a one and one-half stage, liquid-fueled, rocket-powered (360,000 pounds of thrust) ICBM equipped with radio-inertial guidance and a nuclear warhead. It was stored in a horizontal position on a "soft" above-ground launcher, unprotected from the effects of nuclear blast, and had an effective range, like all Atlas models, of approximately 6,500 nautical miles. The first full Atlas D squadrons became operational in 1960. In these so-called "soft" sites, which could only withstand overpressures of 5 pounds per square inch (psi), the missiles were stored horizontally within a 103 by 133-foot launch and service building built of reinforced concrete. The missile bay had a retractable roof. To launch the missile, the roof was pulled back, the missile raised to the vertical position, fueled, and fired. An individual Atlas D launch site consisted of a launch and service building, a launch operations building, guidance operations building, generating plant, and communications facilities. The launch operations buildings were two-story structures built of reinforced concrete measuring 73 by 78 feet with earth mounded up to the rooflines. Constructed much like blockhouses at missile test ranges, these buildings housed the launch operations crew and were equipped with entrance tunnels, blast-proof doors, and escape tunnels. The guidance operations buildings, which sent course corrections to the missile in flight, were one-story structures, 75 by 212 feet, with a full basement. The basement walls were reinforced concrete and the remaining walls were of concrete block. The power plant was a 63 by 65-foot single-story, concrete block building. It housed three large diesel generators and the pumps for the water system. At the first Atlas D squadron at F.E. Warren AFB, six launchers were grouped together, controlled by two launch operations buildings, and clustered around a central guidance control facility. This was called the 3 x 2 configuration: two launch complexes of three missiles each constituted a squadron. At the two later Atlas D sites, a second at F.E. Warren AFB, and at Offutt AFB, Nebraska, the missiles were based in a 3 x 3 configuration: three launchers and one combined guidance control/launch facility constituted a launch complex, and three complexes comprised a squadron. At these later sites the combined guidance and control facility measured107 by 121 feet with a partial basement. To reduce the risk that one powerful nuclear warhead could destroy multiple launch sites, the launch complexes were spread 20 to 30 miles apart. The Atlas E was the first to use an all-inertial guidance system and the improved MA-3 propulsion system. Its first successful test flight was in February 1961. The second operational Atlas ICBM configuration, the series E, possessed all-inertial guidance, improved engines (389,000 pounds of thrust), a larger warhead, and was stored in a horizontal position in a "semi-hard" coffin-type launcher. The major enhancement in the Atlas E was the new all-inertial system that obviated the need for ground control facilities. Since the missiles were no longer tied to a central guidance control facility, the launchers could be dispersed more widely. Thus, the three Atlas F squadrons located at Fairchild AFB, Washington; Forbes AFB, Kansas; and F.E. Warren AFB, Wyoming; were based in a 1 x 9 configuration: nine independent launch sites comprised a missile squadron. The Atlas Es were based in "semi-hard" or "coffin" facilities that protected the missile against overpressures up to 25 psi. In this arrangement the missile, its sup-port facilities, and the launch operations building were housed in reinforced concrete structures that were buried underground; only the roofs protruded above ground level. The missile launch and service building was a 105 by 100-foot structure with a central bay in which the missile was stored horizontally. To launch a missile, the heavy roof was retracted, the missile raised to the vertical launch position, fueled, and then fired. The 54 by 90-foot launch operations building was 150 feet from the missile launch facility; the two were connected by an underground passageway. The launch operations building contained the launch control facilities, crew's living quarters, and power plant. The Atlas E launch sites were spaced approximately 20 miles apart. The Atlas F missile was superior to its predecessors in several ways. The Atlas F had an improved fuel loading system that allowed the missile to be fueled and fired more quickly. It was also designed to be stored vertically in hardened silos. The first successful Atlas F flight was in July 1961. Like the E model, the Atlas F was equipped with all-inertial guidance, but possessed improved engines (390,000 pounds of thrust) and a quicker reaction time due to its storable liquid fuel. The Atlas F missiles also were deployed in "hard" silo-lift launchers which stored the missiles vertically in underground, blast-protected silos and used elevators to raise the missiles to ground level for launch. The Atlas F, the most advanced of the Atlas series, were designed to be stored vertically in "hard" or "silo" sites. With the exception of a pair of massive 45-ton doors, the silos, 174 feet deep by 52 feet in diameter, were completely underground. The walls of the silo were built of heavily reinforced concrete. Within the silo the missile and its support system were supported by a steel framework called the crib, which hung from thewalls of the silo on four sets of huge springs. Adjacent to the silo, and also buried underground, was the launch control center. Built of heavily reinforced concrete, it was 27 feet high, 40 feet in diameter, and contained the launch control equipment plus living arrangements for the crew. The control center was connected to the silo by a cylindrical tunnel 50 feet long and 8 feet in diameter. The tunnel provided access to the silo and served as a conduit for the launch control cabling. In the firing sequence the missile was fueled, lifted by an elevator to the mouth of the silo, and then fired. Although the silo sites were by far the most difficult and costly sites to build, they offered protection from overpressures of up to 100 psi. The Air Force deployed six squadrons of Atlas Fs, one each at Schilling AFB, Kansas; Lincoln AFB, Nebraska; Altus AFB, Oklahoma; Dyess AFB, Texas; Walker AFB, New Mexico; and Plattsburg AFB, New York (the only ICBMs ever based east of the Mississippi). Each squadron included 12 launch sites. Distances between the sites ranged from 20 to 30 miles. Meanwhile, considerable progress was made in developing second-generation ICBMs such as the Minuteman. Among the numerous advantages the newer missiles had over the Atlas was their ability to be launched from hardened and widely dispersed underground silos. Minuteman was also more economical to operate, more reliable, and because of its silo-launch capability, better able to survive a nuclear first strike than their first-generation counterparts.